Our All Together backpack is large at approximately 17" x 18". 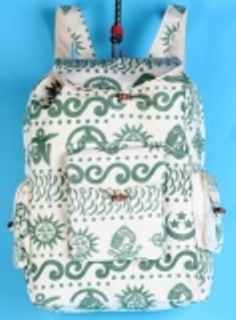 It has a block print design with a celestial tribal look. Made of 100% cotton from a fair trade coop in Nepal. There are 2 side button pockets and 1 front button pocket. The top is a drawstring closure with a button over flap for added security. Straps are adjustable to various lengths. use it as an overnight bag, school bag, or a day bag to hold all of your stuff.